The Communist Party USA and Democratic Socialists of America have realized their mistake. After working hard to elect their long time friend and ally, Barack Obama in 2008, the marxists relaxed a little and waited for "change" to come. They didn't figure on the level of resistance their programs would generate via Glenn Beck, the Tea Party movement and patriotic elements in the Republican Party. Realizing that their socialist agenda hangs in the balance, the Communists and D.S.A. are working overtime to re-invigorate the Obama coalition - both to counter the Tea Party and to keep the Democrats in power after the looming mid term elections. Discounting the obvious lies and propaganda, there is a serious message in this article on D.S.A. 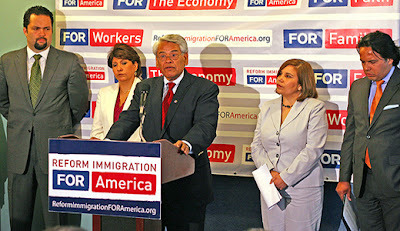 official, Eliseo Medina from the from the Communist Party USA's latest Peoples World. The 567 organizations and groups that turned out several hundred thousand people for the "One Nation" march in Washington on Oct. 2 will try to stay together to work on each other's causes after the Nov. 2 election, a top union participant says. In an interview with Press Associates during the march, new Service Employees International Union secretary-treasurer Eliseo Medina added that for many of the groups involved, it would mean "getting out of the silos" of their own causes. The coalition, including SEIU, the AFL-CIO, AFSCME, the teachers, the National Nurses Union, the Communications Workers, the Transport Workers Union and many other national and local unions, got behind the march for two reasons. One was to show that progressives can muster more numbers than the radical right tea party zealots of radio talker Glenn Beck and GOP politician Sarah Palin. They led a similar march at the Lincoln Memorial - site of the Oct. 2 rally - several weeks before. The other was to energize the progressive forces for the final days of the 2010 election campaign. Medina admitted that energy and enthusiasm among progressives had slacked off in the last two years, after the 2008 election brought Democratic President Barack Obama into office, accompanied by Democratic majorities in Congress - all elected with heavy labor support. "There was such a sense of excitement in 2008. We forgot and left everything to Obama," he said. "But then we saw issue after issue - health care, tax cuts for the middle class, immigration reform - go down" to Senate GOP filibusters and obstructionism. The groups then "realized we had to do something, but organizing takes time," veteran organizer Medina admitted. The left knows exactly what is at stake here. The Tea Party and its allies also understands that this election could decide the future of America for ever. The big question is - which way will the center vote in November? I believe America's future hinges on whether or not We The People wake up to the NWO Illuminati plots to eliminate 80% of the world population, as well as the long range Communist takeover now in progress. The direction that the center votes will be a key, as you concluded. If Americans wake up in time, they can determine the outcome of the elections. There are takeover elements in high places in both American political parties, as well as other areas of govt. Two threats designed by one mastermind organization. Many expose them, but the sheeple seem to prefer to sleep until slaughter time. Certainly, taking control of Congress from the Communists who are in control now is necessary, but I also believe that taking Democratic control of Congress in November will not save America in time. I believe the People will find that they'll need to take a more active role in their govt if they want to leave a future for their children. Grim, but an accurate assessment from my level. Candidates elected in November will not take office until January. There are a couple special cases this year: Some in Illinois, Delaware and West Virginia are expected to cast their first votes within days of the Nov. 2 election. A lot of action by the will of the real American people needs to happen quickly, not the handful that has been ruling in secret. ... but I also believe that taking Democratic control of Congress in November will not save America in time. taking away Democratic control of Congress in November will not save America in time. I almost choked on up my coffee, got an email already. I would love to see George Soros lose some of his money for a change. I would also love to see this coup fail miserably. I hope this is the case, but fear it may be too late.